So Berkhamsted Town Council opens its 'Berkhamsted Heritage Walk' leaflet. This partners the 32 blue plaques that were installed in 2000 on some of the town's most significant buildings. In 1992 a large team of archaeologists excavating along the route of the Berkhamsted bypass before it was built, unearthed evidence of a sequence of occupation from far earlier than had previously been thought. Neolithic, Bronze Age, Iron Age and Roman finds showed that the Bulbourne Valley around Berkhamsted had been peopled continuously for over 5000 years. Common. Another legacy of the Saxons is the name of the town, the original meaning of which was probably 'settlement among the birches'. 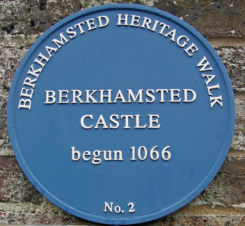 Then one of the great events that made 1066 the best remembered date in English history took place in Berkhamsted. Here the Saxon leaders offered the crown of England to William the Conqueror after his victory in the Battle of Hastings and his devastating march, encircling London. One of William's first initiatives was to set about fortifying his new kingdom with castles, and one of these was built at Berkhamsted. Its first owner was William's half-brother, Robert, Count of Mortain, and until it was abandoned in 1495 Berkhamsted Castle was mainly a royal residence. The first buildings were of wood, but later it was rebuilt and enlarged in the local building materials – flint, and soft limestone. Most of the castle buildings were later demolished for the re-use that could be made of these building materials, but the impressive earthworks and moats have largely survived. During the 400 years when the castle was occupied it had many notable associations. In the 12th century Thomas a Becket was Constable of the Castle before becoming Archbishop of Canterbury, then two centuries later Chaucer was clerk of works here. In 1250 King Henry III's brother, Richard, Earl of Cornwall, lived in the castle, and from here Richard's son, Edmond, founded the nearby monastery of Ashridge. Berkhamsted Castle was the favourite residence of the Black Prince. Here he honeymooned with the Fair Maid of Kent, and from here he rode off at the head of his troops, many of them Berkhamsted men, to fight the battles of Poitiers and Crecy. The last occupant was the influential Cicely, Duchess of York, who lived in the castle during the Wars of the Roses. Granddaughter of John of Gaunt, founder of the House of Lancaster, she married Richard, Duke of York, head of the rival House of York. She was the mother of two Kings of England – Edward IV and Richard III, and grandmother of another, Edward V, all of whom died in tragic circumstances; but she lived to see the end of civil war and the establishment of the House of Tudor. The building of the castle gave impetus to the expansion of Berkhamsted into a flourishing market town. From the beginning of the 13th century substantial buildings, including what claims to be the second largest parish church in Hertfordshire, Berkhamsted St Peter, were constructed along the old Roman road, and there was a busy market. At its peak in medieval times Berkhamsted High Street was lined with houses, shops and halls, parts of which still survive in several buildings. During alterations to one of them as recently as 2003, experts from English Heritage were surprised to find a section of a hall which they dated as early as 1267, making it the oldest timber-framed urban building in England. But in the three centuries following the loss of its royal connections Berkhamsted rather fell into decline. Its ancient charters ran out and its market no longer had the monopoly it once enjoyed. Berkhamsted would have become something of a sleepy backwater if it had not been that the High Street continued to be one of the major trunk roads from London. Such was the importance of this road that it was necessary to set up a turnpike trust in 1762 to make sure it was properly maintained. The coaches, wagons and cattle being driven to the London markets brought income to the town, and several old coaching inns can still be seen in the centre; but all this was to change after the coming of the canal in 1798 and then the railway in 1835. At first these new transport routes were slow to affect Berkhamsted's economy; but as the 19th century went on full advantage was taken of having them on the town's doorstep, for example in the expansion near the centre of Cooper's, the world famous manufacturer of sheep dip. Berkhamsted grew fast then, with new houses, churches, schools and shops. Improved train services allowed clerks working in London business houses to live in a pleasant country town and travel to work daily. Berkhamsted became a commuter town: but it has always been much more than that. Today Berkhamsted continues to change. There is an insatiable demand from people wishing to live in the town, constrained as it is from expanding by the Green Belt all round it. Most industry has gone, the sites of old factories being re-developed for housing; but other businesses have moved in. The opening of the bypass in 1992 brought relief from the continuous heavy traffic through the town centre, and substantial improvements were made to enhance the High Street. The heart of the town is a conservation area, with a comfortable blend of the old and the new. Many small and medium-sized companies have chosen to have premises in Berkhamsted, and there are purpose-built office buildings, both near the town centre and in the industrial area. Several of the town's historic houses have been adapted as offices, notably Ashlyns Hall, which is now the headquarters of a large international company. Although the old industries of Berkhamsted may have disappeared, some light industry flourishes, for example printing, in the industrial area centred on Northbridge Road. Today's Berkhamsted has a real feeling of prosperity.